To Cite: Young Park J, gyoon Park J, Jin Lee S. Cavernous Hemangioma of the Rib: A Case Report, Iran J Radiol. 2016 ; 13(3):e31677. doi: 10.5812/iranjradiol.31677. Hemangioma of the rib is a rare benign vascular tumor. Herein, we report a 63-year-old man presenting with hemangioma of the left sixth rib. An osteolytic eccentric expansive mass with calcification and focal cortical disruption was detected on chest computed tomography (CT). The mass showed low 2-deoxy-2-[18F]-fluoro-D-glucose (18F-FDG) avidity on positron emission tomography. The patient underwent resection of the left sixth rib. Based on the histopathology findings, a diagnosis of cavernous hemangioma was made. Rib hemangiomas and malignant lesions appear similar on CT scans; therefore, most cases of rib hemangiomas reported in the literature were treated with rib resection. However, rib hemangiomas should be included in the differential diagnosis of an asymptomatic patient if an osteolytic expansive lesion containing sunburst calcifications with low 18F-FDG avidity is observed on a CT scan. Bone hemangiomas account for about 1% of all bone tumors and commonly involve the vertebrae and the skull (1). 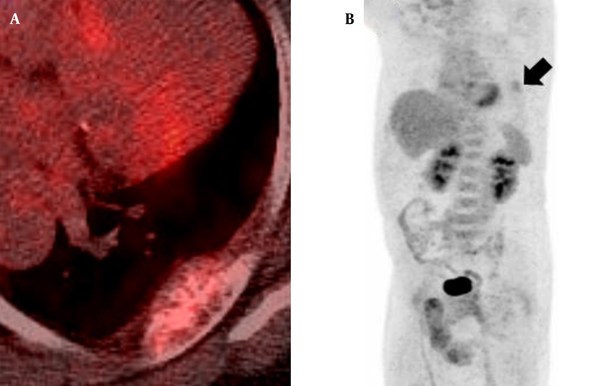 Hemangioma of the rib is uncommon and its diagnosis based on its 2-deoxy-2-[18F]-fluoro-D-glucose (18F-FDG) avidity on positron emission tomography (PET) scan is extremely rare. Herein, we report a 63-year-old man in whom a hemangioma of the left sixth rib was incidentally detected on a plain radiograph. For further investigation, computed tomography (CT) and 18F-FDG PET were performed. A 63-year-old man was admitted to our hospital for evaluation of an incidentally detected rib mass on a plain chest radiograph. The patient was taking antihypertensive medication and had an otherwise unremarkable medical history. The laboratory investigation values including serum tumor marker levels were within normal ranges. An anterior-posterior view of a plain chest radiograph taken at another outpatient clinic revealed a moderately defined mass in the left upper hemithorax arising from the sixth rib (Figure 1). For further evaluation, CT scan (Somatom definition flash, Siemens healthcare, Forchheim, Germany) was performed. It demonstrated an osteolytic eccentric expansive mass with sunburst calcification and focal cortical disruption at the posterolateral arc of the left sixth rib, measuring 5.5 × 2.5 × 1.5 cm (Figure 2). Based on CT scan findings, differential diagnoses of malignant tumors, including chondrosarcoma, metastatic tumor, or multiple myeloma were considered. To distinguish between the differential diagnoses, a 18F-FDG PET/CT scan was obtained (GE, Discovery, Milwaukee, WI, USA), on which the lesion showed low 18F-FDG avidity (the maximum standardized uptake value [SUVmax] was 2.4). No other significant 18F-FDG uptake was observed on the PET/CT scan (Figure 3). The patient underwent rib resection via posterolateral thoracotomy approach. A definite diagnosis of cavernous hemangioma was made based on histopathology examination results of the resected mass (Figure 4). The mass was composed of thin-walled blood vessels with dilated channels containing red blood cells and lined by a single layer of endothelial cells. Figure 1. A 63-year-old man presenting with an incidentally detected rib mass on a plain chest radiograph diagnosed as hemangioma. 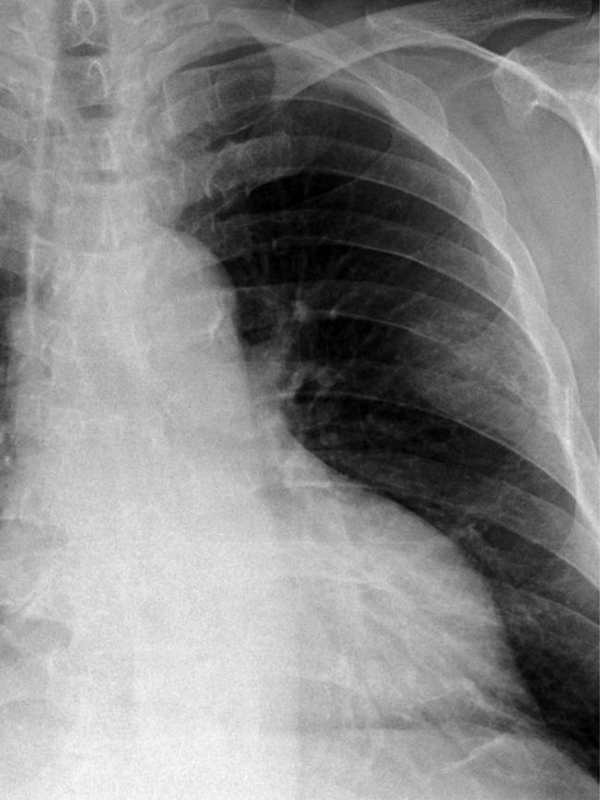 Plain radiograph of the chest illustrates a moderately defined mass in the left upper hemithorax arising from the sixth rib. Figure 2. Axial contrast-enhanced chest CT image (A) and coronal reformation image (B) show an osteolytic eccentric expansive mass in the posterolateral part of the left sixth rib with sunburst calcification and focal cortical disruption. Figure 3. 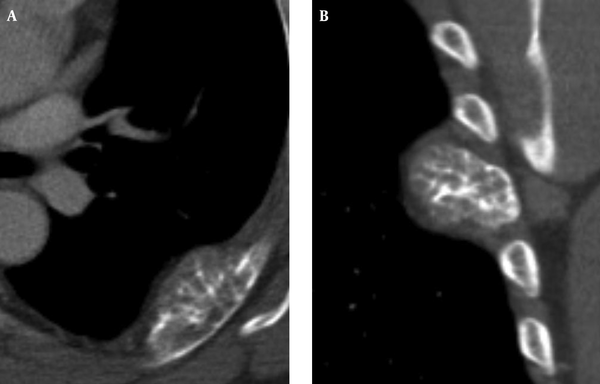 Axial 18F-FDG PET/CT fusion image (A) and MPI image (B) demonstrate non-discrete focal 18F-FDG uptake (SUVmax 2.4) in the left sixth rib (arrow) without any other abnormal 18F-FDG uptake lesion. Figure 4. Microscopic findings of the resected mass. A, Normal bone tissues are interspersed within the mass (hematoxylin-eosin, original magnification ×20). B, The mass consists of thin-walled blood vessels with single layer of endothelial-cell lining containing red blood cells (hematoxylin-eosin, original magnification ×100). Hemangioma is a benign neoplasm of blood vessels that can occur throughout the body. Histologically, there are four types of hemangiomas: cavernous, capillary, venous, and mixed type. Cavernous hemangiomas are the most common and account for up to 50% of all hemangiomas. They consist of dilated vessels lined by a single layer of endothelial cells surrounded by a fibrous stromal layer. Most cavernous hemangiomas involve the medullary and intracortical portion of the bone. Capillary hemangiomas account for 10% of all hemangioma cases and consist of multiple tortuous small vessels lined with epithelium, while venous and mixed type hemangiomas are rare (2). Most cases of bone hemangiomas develop in the vertebral body or the skull (1). Hemangioma of the rib is rare, both as a rib tumor and as a bone hemangioma (3). It is mostly detected incidentally as it is generally asymptomatic (4). However, about 50% of rib tumors are malignant, and it is difficult to distinguish a rib hemangioma from a malignant tumor such as a chondrosarcoma, metastatic tumor, or multiple myeloma (5). Bone hemangiomas can present with different features on scans obtained using varying imaging techniques. Hemangiomas in flat bones including the ribs can appear as aggressive tumors demonstrating cortical destruction with extraosseous mass formation and osteolytic lesions. As these imaging findings are typically observed in malignant lesions, the diagnosis of a rib hemangioma based on imaging findings alone might be challenging. 18F-FDG PET can detect the elevated glucose metabolism of cells, and is widely used for differentiation between benign and malignant neoplasms. Malignant lesions tend to be 18F-FDG avid and benign lesions generally show lower 18F-FDG avidity (6). A benign lesion showing typical low FDG avidity includes osteochondroma, enchondroma, hemangioma, and intraosseous lipoma (7-12). Choi et al. reported that the mean SUVmax values in the benign rib lesions were 2.5 ± 1.1 (13). The SUVmax of our patient’s lesion was 2.4, which implied that the lesion was more likely to be a benign tumor rather than a malignant one. Rib hemangiomas and malignant bone lesions can appear the same on imaging scans; therefore, most of the patients with a rib hemangioma undergo rib resection. However, if CT scans show an osteolytic expansive lesion containing sunburst calcifications with low 18F-FDG avidity, a diagnosis of rib hemangioma should be considered. Authors' Contributions: Joon Young Park carried out the final preparation of the manuscript. Jin gyoon Park contributed to the discussion in the conclusion, and critically reviewed the manuscript. Seung Jin Lee contributed to the final preparation of the manuscript. All authors contributed to the content and approved the final version of the manuscript. Declaration of Interest: The authors report no declaration of interest.